Bohol lies southeast of Cebu and southwest of Leyte. The island, characterized by hilly and rolling terrain, has around 167 mountains, 73 islets. Bohol Philippines has slowly but steadily been able to develop the needed infrastructure for its tourism industry. The infrastructures include hotels, resorts, roads, and upgrading of airports and other ports. The province has a total land area of 411,746 hectares divided into 47 municipalities and one city, Tagbilaran, the capital. Nearly all the 47 municipalities have natural attractions that draw both local and foreign tourists to Bohol Philippines. 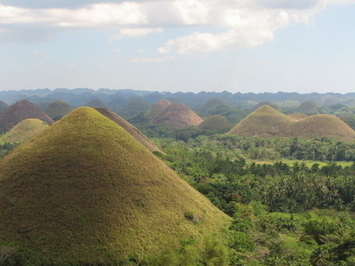 The most famous of the natural tourist attractions in Bohol Philippines is the Chocolate Hills, numbering 1,268. These almost perfectly coned hills, which abound in various heights and sizes, are scattered throughout the towns of Carmen, Batuan and Baclayon. Two of the 1,268 mounds have been developed into a resort. On top of the first hill are two youth hostels with a conference room, cozy cottages, a swimming pool and a tennis court. On the second hill is an observation deck with 215 concrete steps. At the top, one can view an exquisite panorama as far as the eyes can see. Elly Hill with an elevation of 100 meters, its formation similar to Chocolate Hills; Rajah Sikatuna National Parks; Hinagdanan Cave in Dauis town, which has an underground bathing spring lit by a pair of natural skylights; Punta Cruz watchtower, an ancient stone structure built to repel Moro pirates during the Spanish times; Baclayon Church; floating restaurant in Loboc; and the towns of Laoay, Bilar and Loboc. Ringing Bohol Philippines are smaller islands like Panglao, Pahjian, Paro and Poso, known for their beautiful diving sites. Panglao provides the most attractions, which is 9,000 hectares of land mass. The island has two kilometers of white sand beach that stretches about 700 meters inland and five to six kilometers southward. You may choose to go swimming, snorkeling, kayaking or island hopping, fishing, scuba diving. Popular dive sites are Arc Point, Bikini Beach, Alona Beach, Puntod Point, Pamalican Island, Cervera Shoal, Balicasag Island, Doljo Point, Momo Point, Gak-ang Point, Napoling and Tagnan Point. There is also Bohol Beach Club, fronting a beautiful white sand beach with crystal-clear water. Bohol Philippines, one of the oldest provinces in the country, is known as the site of the First Blood Compact (March 16, 1565) between Rajah Sikatuna and Miguel Lopez de Legazpi. The annual spectacular festival of the province is “Sandugo,” which features an agro-industrial fair, a cultural and historical showcase, sports events, beauty pageants and street dancing, which culminates with the re-enactment of the blood compact. The week-long fun is held in the third week of July. Bohol Philippines is home to the oldest stone church in the country, the Baclayon Church, built by the Jesuits in 1595 in the town of Baclayon, seven kilometers from Tagbilaran City. The church’s massive edifice still retains its century-old architectural design. Religious relics of the early 16th century can be found in its museum. There are old urns, antique chalices, missals made of sheepskins and other religious items. On the other hand, the Tagbilaran Church was built by the Jesuit missionaries in the 18th century. Valencia, 42 kilometers from Tagbilaran, is the site of the Badian Springs, which is noted for its clear, cool waters. Another popular camping site is the Boy Scout Reservation Camp, which has a natural swimming pool. Talibon is the birthplace of Carlos P. Garcia, fourth President of the Republic. In the municipality of Dauis in Panglao is a wonderful underground showcase of natural stonework. It is an eerie underworld of stalactites and stalagmites vividly reflected in an underground pool of cool, fresh water gushing from the cave’s rocky sides. Through a couple of natural openings, rays of sun pierce through and the shafts of sunlight serve to illuminate the whole underground scenery. The floating restaurants of Loboc are a special treat while cruising by boat along the palm-fringed Loboc River in Loboc town, some 24 kilometers away from the capital. The floating restaurant not only provides good food but a fascinating boat ride from Loay Bridge to Busay Falls. The smooth journey begins at the Loay outlet of the river, snakes through the serene waters for at least an hour or more and ends up at Busay and its surrounding smaller falls that invite one to take a dip in the cool waters. 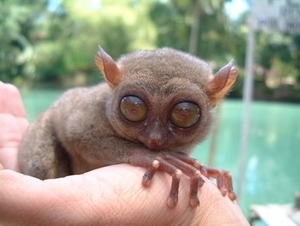 Of special interest to environmentalists on Bohol Philippines is the Tarsier, the smallest primate found only in Bohol. The Tarsier, known locally as maomag, mago, magau or amag, feeds on the fruit trees and can live up to 20 years. The mating month for the Tarsier is from December to March; the female gives birth from June to July. The newborn Tarsier is about the size of a thumb and clings to its mother for the first two weeks as it suckles while the parent goes about its business. By the first week, the mother begins to augment breastmilk with insects. The color of the baby Tarsier changes from brown to reddish brown as it gets older. It measures four to five inches with a tail slightly longer than the body. It has brown eyes, large hairless ears and long claws, and its head can turn almost 360 degrees. Philippine Airlines (PAL) operates flights to Tagbilaran, Bohol Philippines thrice a day from Manila or Cebu City. For more leisurely travel, one can reach Bohol by boat from Cebu City with multiple sailings every day by Supercat and OceanJet fastcraft.